Mahavir Jayanti is the day on which the birth of Mahavira, founder of the modern Jain religion and the last of the 24 Jain Prophets is celebrated. The devotees of this religion do not even harm a fly. Some devotees cover their mouths with a tiny cloth, in order to avoid the possibility of killing of germs when they breath. It does not believe in a single God. It teaches the practitioners of taking the responsibility of their actions, thereby following the Karma theory. It teaches the followers to live a very simple life, in an attempt to clear their sins and attain salvation. Celebrations take place in Jain temples throughout India. 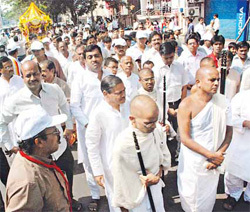 Mahavir Jayanti is celebrated widely by the Jain community. 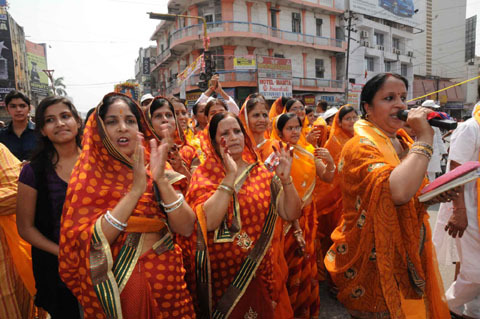 Due to the high numbers of Jains in Rajasthan and Gujarat, most celebrations are seen in these states. Temples that host Mahavir Jayanti festival are decorated with flags to signify the birth of Lord Mahavira. Each locality holds a abhishek (traditional bath) for a deity of Lord Mahavira. Following the bath, the deity is carried in a parade throughout the streets of that region. Each parade has its own variety but generally comprises of drummers, horses, elephants, singers and lamps. The parade ends at a temple, shrine or large communal area where people may pray and meditate. You can use online invitation from Yoovite to make everything easier. Inviting friends and family to the Mahavir Jayanthi celebrations is one of the most difficult jobs. There are chances that you will miss inviting someone important for the party. When you use Yoovite.Com, it becomes so easy that everything gets done in a few simple steps. You can begin by selecting a template from the list we have. After you have made your choice, simply enter the details like venue and time and send it to all your friends and relatives at once. The site also has a nice RSVP option which will help you keep track of all the guests that will attend your party.